New York: This summer the Rubin Museum of Art showcases a fascinating exhibition that presents an informed peek into the lives of the Naga people, curated by Jan Van Alphen. The highlight of the exhibition is the remarkable selection and contextualization of the material culture of the Nagas which inform the viewer about their history and ways of life. The exhibition includes textiles, jewelry, weaponry and ceremonial objects, black-and-white photographs and a video installation. The Naga are a group of culturally and linguistically linked tribes inhabiting the mountainous regions of north-east India and north-west Burma. Known to be fearsome headhunters, their neighbors avoided confrontations and direct contact with the tribes. This allowed them to develop a distinctive material culture and a complex system of norms and taboos. The British colonization followed by the 20th- century conversion by Baptist missionaries of nearly the entire Naga population to Christianity resulted in drastic changes in their way of life. Nonetheless the Naga did not abandon their long held traditions and today they live between two extremes: they maintain a highly developed aesthetic culture informed by ancestral traditions while still transformed by outside influences. Ancient Naga customs and habits remain alive under a layer of Christian devotion. A focal point of the exhibition is the large-scale black-and-white photographs by the anthropologist Christoph Fürer-Haimendorf. 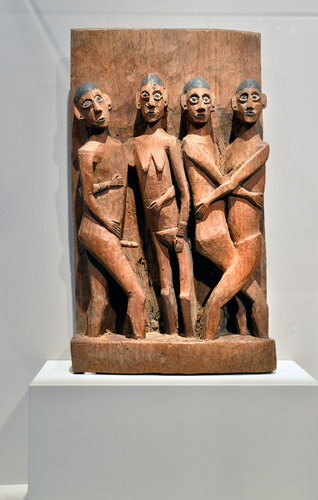 Assembled during his field research in 1936-1937 and now in the collection of the Welt Museum Wien in Vienna, it is one of the oldest collections of Naga art. These photographs successfully provide a context for the objects on view- this interactive process enabling the viewer to grasp the culture and the artifacts with greater depth. The exhibition is divided into six sections. The first expounds the ritual life of the Naga, highlighting the practice of headhunting and its association with prestige among the tribesmen. 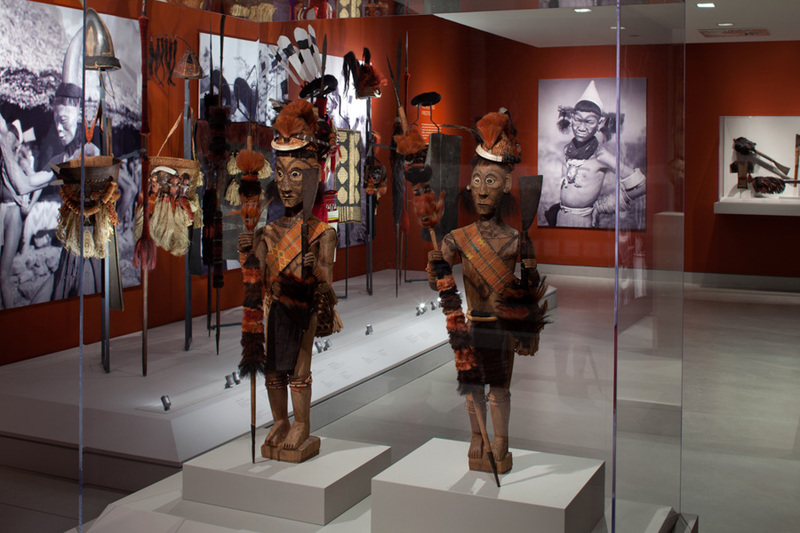 This section shows head trophies, ceremonial hats and weaponry. 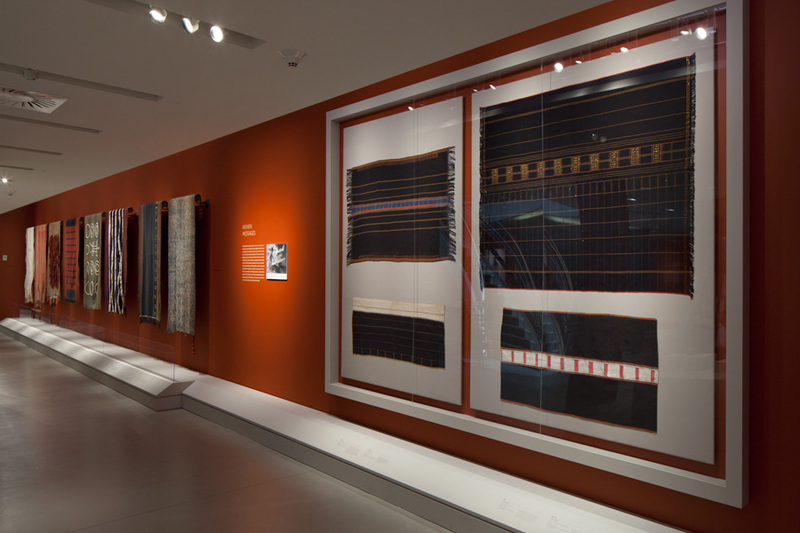 The second section about clothing explains the meaning of body cloth, the symbols woven into the warp and weft of the cloth- indicating the wearer’s tribe and position. These body cloths are commonly worn over modern clothing during special events. The third section explains how Naga jewelry goes beyond its functional and ornamental role and like their garments is symbolic of the wearer’s identity and status. 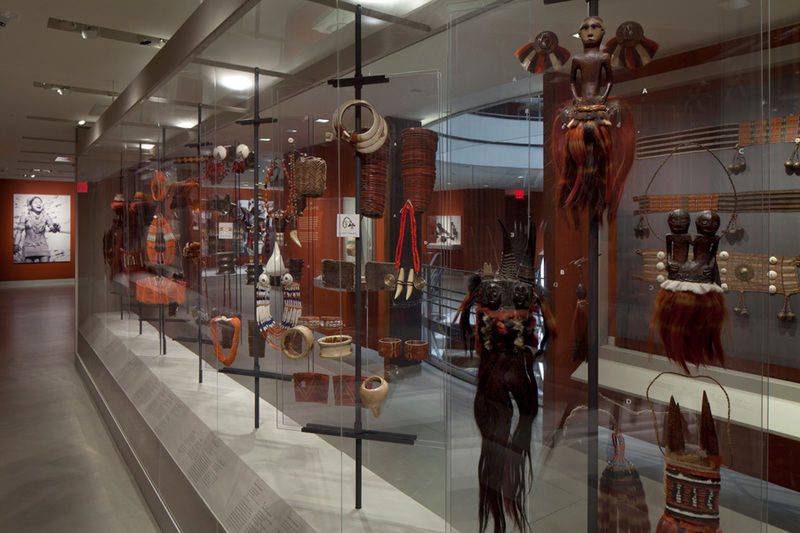 On view are chest ornaments, earrings, headdresses, armbands, sashes, girdles, and aprons worn by both men and women. The forth section presents the artisanry of the Naga tribes, the specific crafts delineates to women or men. 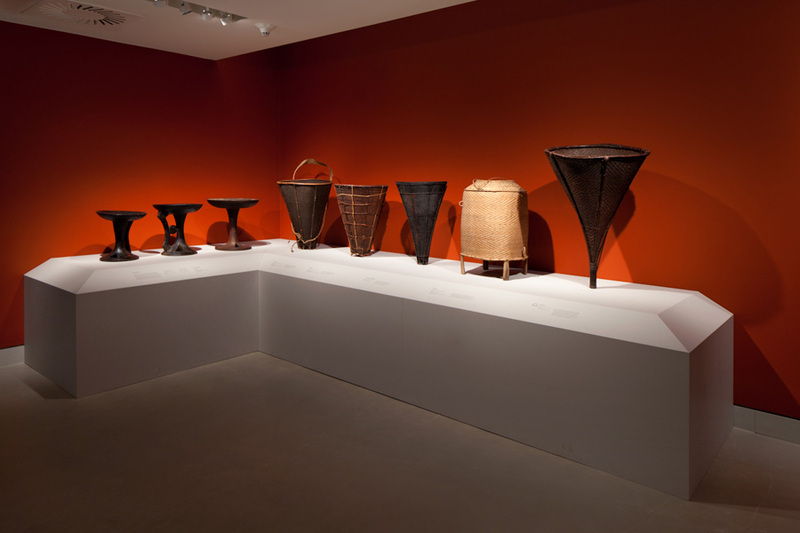 This section displays ceremonial baskets made of bamboo and dishes carved out of wood. The fifth section of the exhibition is dedicated to the Morung- the tradition men’s house central to Naga lifestyle. The space served as a community center, school, youth club- all combined in one. 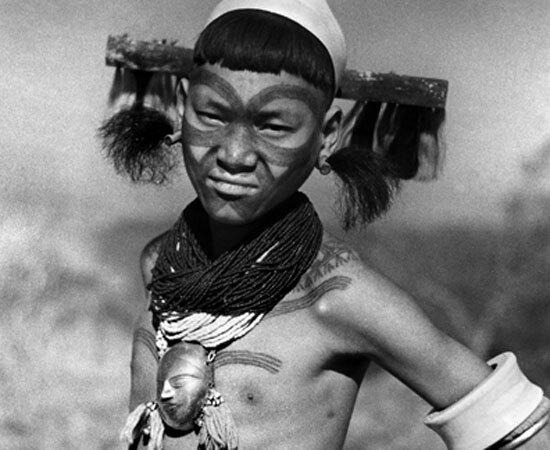 According to Naga tradition a boy would typically join at the age of nine or ten and live there until he was married. There he would learn the skills required for adulthood from the older members of his community. 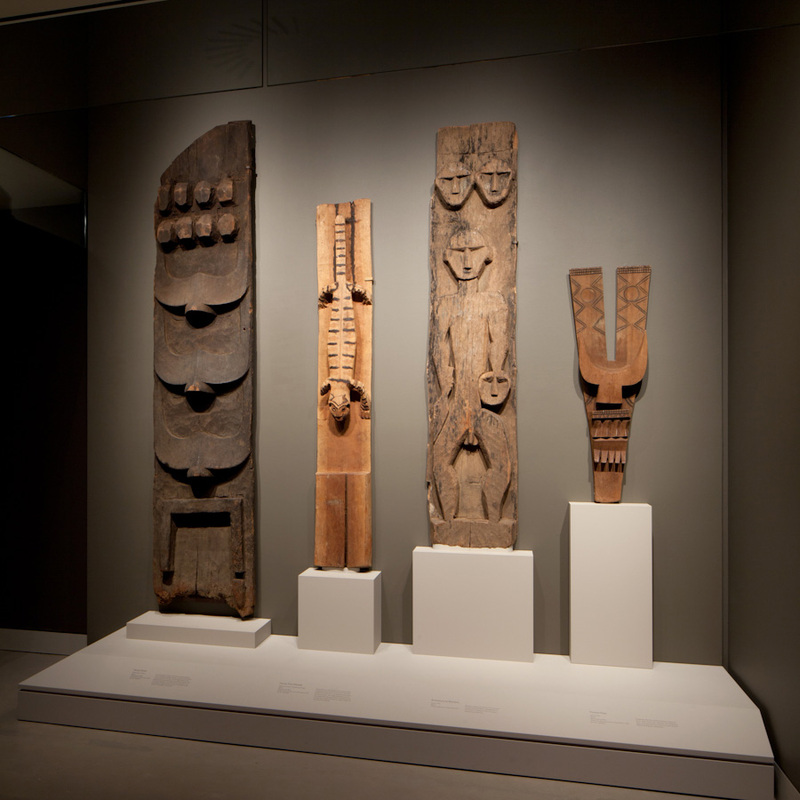 The following section presents wood carvings and sculpture, especially those employed to decorate the Morung. The most impressive woodcarvings were the giant log drums, which are shown in a video in the exhibition alongside models of dugout drums. These dugout drums embodied the community’s potential for happiness and brought with them good luck, wealth, and prosperity. This is the second exhibition hosted by the Rubin Museum of Art on the Naga. It is on view till September 16, 2013. The programme for the exhibition includes a talk with anthropologist Christian Schicklgruber and collector of Naga art John D. Marshall. There are also two short films being shown at the Museum.